I’ve been living in France now for over 5 years, and little by little, it’s been changing me. 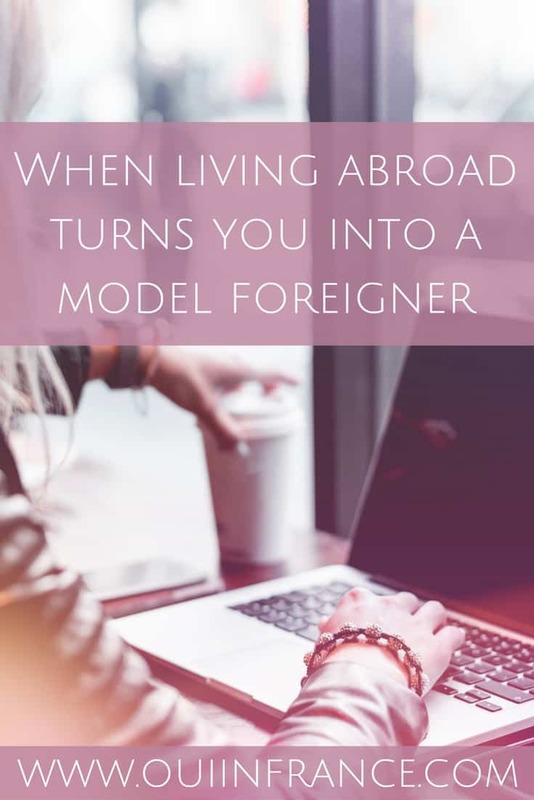 Looking back, I’ve noticed some distinct areas where living abroad has molded me into a model foreigner. You know, the type of person who plays by the rules and does her best to fit in and do as the locals do. Why is this the case and how did it happen? It’s no secret that Americans don’t have the best reputation abroad. People think of us as loud, ignorant, superficial, ethnocentric, and lacking interest in the world beyond the borders of the USA. Whenever I can, I do my best to dispel these myths and show people that Americans are diverse, kind people who defy the stereotypes. We’re worth getting to know. As an American in France, I feel like I often represent more than just myself every time I step outside. I’m an unofficial spokesperson for﻿ all things American including our politics, habits, culture, and more. I field questions that run the gamut. I’m usually the only American people have ever met in person and have to make a good first impression. Every time. That carries weight. I want to do things right and explain our country and culture. I care what people think. I always have. And I care more than ever about how I’m perceived as an American in small-town France. Sometimes I go out of my way to be a more polite and patient version of myself. People don’t notice I’m not French until I open mouth, so at first glance, I act like anyone else in places like the grocery store, post office, or bank. But in places I frequent often where they know I’m foreign, I’m always on my best behavior. I patiently wait in line even when it’s maddening to see only one cashier open at busy times, don’t speak loudly on my phone in English (or speak loudly in public ever). I pay my taxes. I always pick up after my dog. I adapt to the French way. Am I doing it right? Sometimes I psyche myself out and wonder if people are noticing me in all the wrong ways despite my best efforts to fit in. Because I’m different. I sound different. I’m foreign. I’m other. Are they judging me? Are they wondering where I’m from? Why I am here? When I am leaving? Maybe no one cares. No one notices. I make the effort for myself because it’s what I should do. 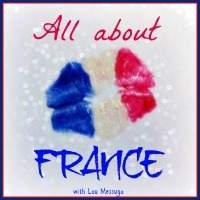 I’ve internalized French behavior and social norms that make me more pleasant, accepted, and integrated. It’s as if I’m overcompensating for my nationality’s perceived shortcomings. Did that person just say comment (what) after we said something because we have an accent or because they just didn’t hear us? Are they squinting at us when we’re talking because something is wrong with their eyes or because they find accents jarring? Is the shopkeeper being rude because they’ve had bad experiences with foreigners or just because they’re having a bad day? Is it me or is it just humans being human? I have no idea. Sometimes it’s probably me and most of the time it’s probably not. All we can do is our best and hope that’s enough. So how has my personality changed? The little things are different. I’m myself but I’m a supercharged version of everything that makes me, well, me. Social enhancements, if you will. Greetings and politeness are on point. My gestures, my topics of conversation, even my bises are now second nature (even if I still hate them). I’m a more socially acceptable version of myself. This wasn’t an intentional thing that I set out to do. It happened naturally a little at a time. Life is slower here. I take my time. I notice the world around me. I see what people are doing. I see how they’re doing it, what they’re saying, and why. French culture has been wearing off on me in the most unexpected ways. Just to clarify, I’m perfectly kind, pleasant, and helpful in English when back in the USA, but I find myself turning it up a few notches in France. I’m overly kind, super polite, and more smiley (which is funny because my natural inclination isn’t to be over the top about smiling at everyone). It’s not fake by any means — hell, it’s become so natural that maybe this is the new me — but it’s different than how I was in the USA. I’ve observed the French and absorbed what I’m able to and modeled it right back at them. It’s become a part of me and I like it. 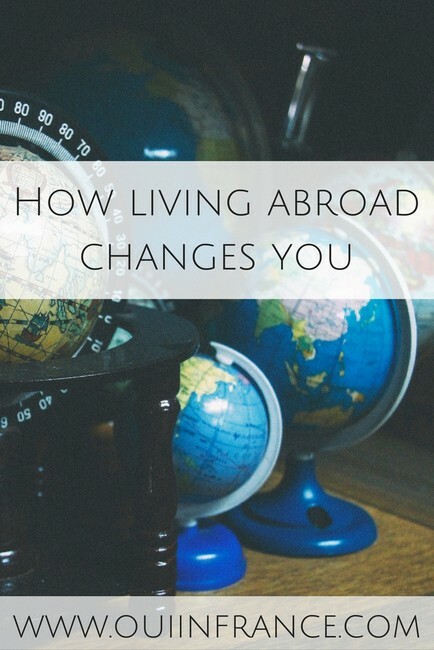 Have you noticed any differences in your personality and how you present yourself and interact with others after moving abroad? Talk to me! P.S. In case you missed it and have noticed the new look, my blog underwent a redesign! Read about it here! Diane, just finished reading this, fantastic job. This is exactly the discussion that I want to post about as well but I think it’ll be interesting because I’m going to post more about how I’m perceived as a visual minority vs. the American stereotype. I’m so (selfishly) glad that you feel the same way about this because I wasn’t sure if it was just me, again, going off the fact that I’m very clearly not Italian so can’t even pretend to mesh into the crowd. I’m gonna keep checking the comments, I’m curious as to what other people will say or if they’ve had a similar experience. Firstly, great new look, although I’m on my phone it still looks the business. I can so relate about trying to compensate for your countrymen’s shortcomings. Never more so than during the last couple of years…post Brexit referendum. If we are to believe what we see in the media, no-one in Brussels has any time for us any more and while I understand the european political stance, I am sort of expecting the general public here in France to feel the same. So like you, I am ultra polite and smiley, I know, it sounds ridiculous to think that I can try to put right our differences by being a ‘model’ Brit and being keen to point out that a great deal of us are far from pleased with the referendum result. However, I’m happy to report that I’ve received no rudeness or indifference and everybody has been most cordial. Thanks so much, Fiona, and HAPPY FRIDAY to you! Happy to hear you can relate! Like you, everyone has been cordial and normal toward me so maybe that acted as positive reinforcement for my model behavior. Not that I go out of my way to any crazy extent, but just turning the la politesse francaise up a notch seems to be working! This is so true! There are polite and rude people in every culture, but if you step out of line as a foreigner (knowingly or accidentally) you will be blamed as a rude Whatever-Nationality. That happens in France, in the U.K., in the U.S…..the us-vs.-them mentality rears its head at the smallest thing. So it’s best to make an effort. Carcassonne attracts a lot of tourists in the summer, between the amazing fortress and the great weather. I love it here and consider myself ambassador of the town, and will stop to help anybody I see examining a map. Since many don’t speak French but do speak English (not necessarily native speakers, but as a second language), they are thrilled to get directions in English. It’s my contribution to local civility and friendliness. Yup, it’s certainly not a phenomenon specific to France! Just the other day, someone told me a story about a rude woman in a shop who was unboxing all these phone cases for no apparent reason. Customers aren’t supposed to be doing that. Long story short, the person who told me the story didn’t just say a “rude woman” but added the fact that she was a foreigner. When any foreigner behaves badly, it’s noticed more than a native, I think. First, I heart the new look! Great job! Second, I can relate to what you’re saying. When I’m in France for an extended amount of time, I find that I too, am a better version of myself. 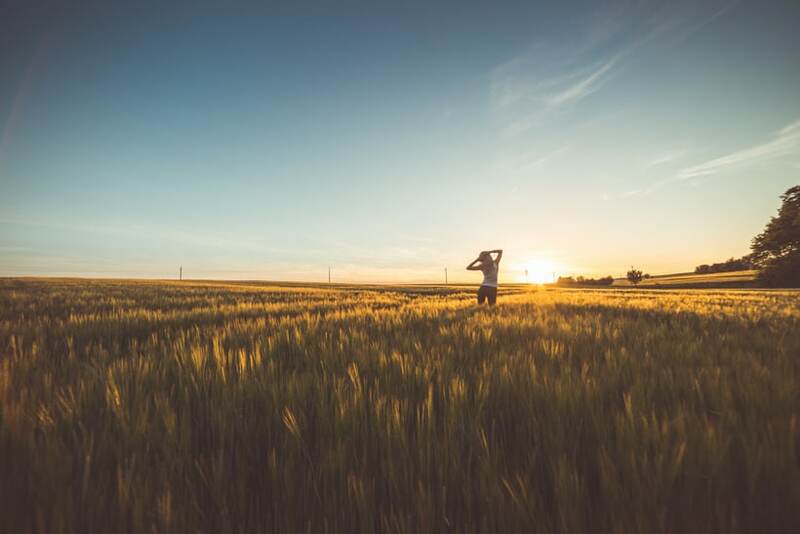 What you said about life being slower made me think that maybe because we Americans in the US are so go-go-go all the time, we lose sight of what is important in our daily lives. For example, It’s slightly stressful knowing that a typical week in my life in the US looks like this: teach fitness classes before and after my normal 9am-5pm job, clean the house, do laundry, go to my friend’s kid’s christening, cook dinner every night, cut the grass, buy a gift for my niece’s birthday… and on and on… We all have busy lives but I think we tend to try to stuff soooo much into a day that we kind of lose the idea of being polite, kind, helpful and relaxed along the way. Since life in France tends to move a scotshe slower, I think it creates an opening in my mind and heart to take a breath and realize that all is well. As a result, I find it easier to be smiley, upbeat, helpful to people and genuinely interested in others. Sorry for the novel! This was a great post and it really resonated with me! Hi Liz! Thanks so much! I can completely relate to what you said about the go-go-go nature of life in the US. I’m sure there are many people in the US who manage to live pretty chill lives, but for many of us, weekends were scheduled and we’d go from meeting a friend to an appointment, to a dinner with family, to this errand, to that errand, etc. I guess some people really like that, or are at least used to it. I was much busier in the USA. I hate being overscheduled and always running around, so France has been good for me in that regard. Maybe a little too much, because here it’s not that I just opt out of things — it’s that I don’t have family here or a network. So even if I wanted to be super scheduled, there wouldn’t be much for me to do! Not sure the other extreme of where I am now is good either. Now instead of rushing around to do this or that, I might walk in the park with my in-laws on Sunday afternoon (like we did last weekend) instead of picking up something at the mall (stores are closed), getting a quick workout in at the gym (gym is closed), etc. Remind me again of what fitness classes you teach! So fun. I looked into that when I arrived here but unfortunately my certification meant nothing here because you have to have a diploma from the state (France) to be able to do anything. Ugh. Hi there! I used to teach indoor cycling and LOVED IT. I still cycle as a participant but miss teaching. Sigh…. So yes, legally speaking, a gym or studio in France or any type of association can not legally employ you as an instructor without a special French diploma (through IRSS or another path I’m blanking on right now) saying you’ve jumped through the hoops. The exceptions might be if you worked for a gym or studio geared toward foreigners (maybe non-French owners) in a major city, but even still, I think the qualifications are necessary. France is big on that. If you have a degree (bachelors or beyond) in exercise science or something along those lines, I’ve heard of people converting their degree but not sure they ended up with a job. In gyms around here, most gym employees (all have the French diploma) are full-time (or close to it) employees teaching a variety of classes and often not of their choosing. And will do light maintenance and intro gym sessions with new members. That stands in sharp contrast to the US where you can become a personal trainer in a matter of months doing a certification on weekends and then passing the test. Or getting a Les Mills certification or Spinning (like I did) or whatever type of class in 10 hours of training, passing a test, and then teaching a few classes a week at your local gym. Not so in France (at least not in my experience). Aw, I’d totes take your class too! Wow, I’m disappointed to hear about how strict the French are when it comes to group ex instruction but I guess it makes sense. Thank you for the info! Who knows,maybe I’ll cook up a side hustle and conduct classes in the back yard! Hahhaa, yes the bise here took some getting used to. So funny you took it home with you and started using it on unsuspecting Americans. I think the French lifestyle has a lot going for it and it’s something that I’ve learned to appreciate more and more the longer I’ve been here! Like you, I often feel that I’m a representative of my country. I’m also perceived as mildly exotic – an American who speaks French! So French people sometimes seek me out to ask me questions – “Is it true Americans eat hamburgers every day?” “Can you study football in college?” “Why aren’t you fat?” I try not to laugh and answer as politely as I can. I am also gratified that American sacrifices during WWII are still remembered and appreciated. I’ve lost count of how many times a French person has thanked me for “saving” France. Whenever that happens, I always return the favor. I express gratitude for France’s essential support during our war of independence and point out that France is America’s oldest ally. Then I tell them something that even most Americans don’t know. There are only two portraits in the House of Representatives, one of the centers of American government. These large paintings hold pride of place, flanking the Speaker’s rostrum. On the left is the father of our country, George Washington; on the right, French general Lafayette. And the painting of Lafayette came first. That’s so nice to hear that the French have thanked you for the service of our countrymen in WW2. I had no idea about the paintings! Have you visited the Hermione frigate in Rochefort? I wrote about that a little last month and learned all about Lafayette. I think you’d like it. Have you seen the film Dunkirk? You might like it as well. We saw a couple of weeks ago. Great article about questions French people ask you. I’ve gotten some of those myself. 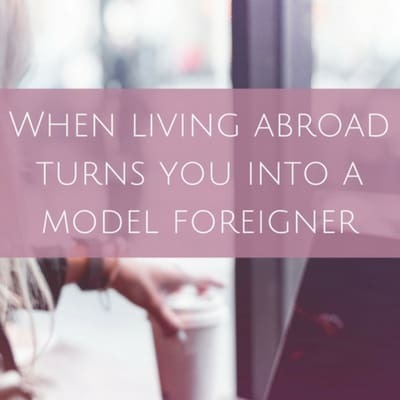 I very much appreciate your “real life” postings and especially the one a couple of weeks ago about the dark side of being an expat. These reminders are so helpful for those of us who long to live in France someday and they temper our often rose-colored expectations. Of course it must be hard with moments of real pain and sadness but those are generally not in our projections of what it will be like for us. Telling the whole story helps to give a clearer picture without illusions and in doing so we’re more likely to take the eventual snags in stride. Hi Linda, thank you so much! 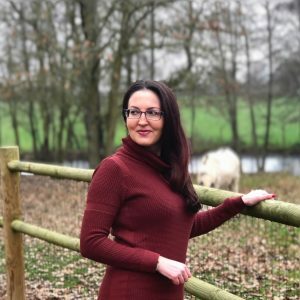 I think the worst thing when moving abroad is to have unrealistic expectations, so if by sharing my experience I can help open people’s eyes, I’m going to do it. Not everyone’s experience will be the same of course. We need to jump in with our eyes open. Wide open. As you said, we’re more likely to take the snags in stride when something tough comes up. So happy my posts have been helpful! Wonderful post Diane! As a Brit living in the US, I can certainly relate. I believe that it’s common courtesy to adopt local social conventions, but as you mention, it can also bring benefits. While it’s my natural inclination to be somewhat reserved and quiet, I’ve learned here that it’s really OK (and often helpful!) to speak my mind and be a little more direct. I’m still learning how to adapt to American culture, but I love the friendliness and hospitality of the people and am so glad that it’s starting to rub off on me! Hi Polly! American culture can be jarring for people not used to us. Tom thinks the overly eager waiters is still nuts and he’s visited a bunch of times, so I completely understand. Even though you speak the same language, the culture can be quite different! What you said about the friendliness is something I miss. Glad we’re rubbing off on you! Really enjoyed this article! I feel like I can appreciate this sort of in a reverse perspective. While I have not had the chance to spend more than a few weeks abroad, I’ve made many international friends here in the states over the years. As such I tend to attend events that they invite me too and I am often one of the few Americans in the group if not the only one. Many a time I have found myself trying to compensate and make sure I, in a way, acquire their customs and behaviors when in their environment so as to be respectful and also as a means to fit in. I found that started to stress me out a bit though as I started to worry so much about fitting in that I had to step back. I reminded myself that I was already friends with them, that they had already accepted me into their world, that they appreciate that I could speak their mother language, and would forgive any faux pas I might make if I was unaware. I think the most important piece is just being comfortable with you. Like you, from these experiences I would say I’ve formed new habits that I appreciate. I’ve also learned to let other worries go more and just enjoy all as a combined experience. Yes! I do notice that I am much more talkative in France. I think the French are very eloquent talkers and more animated. I feel like I have so much more fun chatting in French to a native than I do with my compatriots. That is just one of the ways I feel like my personality has shifted due to French Culture. Totally agree with the cultural ambassador aspect as well. I also find myself explaining multiple perspectives that aren’t necessarily mine. Or I sympathize with a party that I don’t necessarily like in the US because a French ideal has maybe turned me off. It’s a strange feeling, but I think very valuable. Hi Paige, happy you could relate! It’s so strange how one’s personality can shift, well after our formative years, just due to our culture and environment. I’d like to think it’s for the best but I can see someone going the other way if their new home was less encouraging, less welcoming, less friendly, you know. Like are we strong enough to just own who we are and not be affected by the environment? I think it’s only normal to shift and grow as time goes on. Found the whole subject interesting so glad you did as well! Holy smokes this resonated like crazy with me. I’ve always wanted to be a good traveler and avoid making the American tourist mistakes, but it really kicked into overdrive when I moved abroad. You are so spot on—every traveler/foreigner/whatever is a representative of their country, whether they like it or not. I’ve been on the other side of this as well. When I lived in Bogotá, Colombia I would always be asked by locals about my experiences in their country. Based on whatever I said, they’d give me all kinds of advice about things to do (or avoid!). I felt like they felt a responsibility for their reputation as well, which I found very cool and inspiring. Hey Danielle! It’s so strange how we change, isn’t it? It feels like a responsibility sometimes like you said and even if we don’t want that responsibility, it’s clear in most cases that we’re foreigners so it kind of comes with the territory. Happy you could relate to this! We felt the same way after living in Germany for three years. We feel so lost now that we’re back in the States. Everything is so bright and loud and rude. As a long-time French expat (UK, Denmark and now Ireland), I totally relate to what you’re saying here. It is so true that as foreigners, we represent more than ourselves when stepping out of the door. I have to admit that I feel more than a little annoyed when locals put me in a position where I have to defend my home country, whether I like it or not. I’m sure you get a lot of that too as an American. That said, I like to think that living abroad has made me a better version of myself, more open-minded, more willing to take chances, more adaptable too. To the point where I find French customs a tad irritating sometimes! Actually when you live or travel abroad. Most people in a certain country always consider foreigners to travel as high-educated people.